1. In the bowl of your stand mixer, combine the water, yeast, and a pinch of the sugar and set it a aside a few minutes to get frothy. 2. Add the remaining sugar, yogurt, bananas, bread flour, salt, and vanilla. Knead with the dough hook until the cleans the sides of the bowl and start to get elastic. 3. Add the olive oil and continue kneading until the mixture is smooth, silky, and elastic. 4. Form the dough into a ball and put back into the bowl. Drizzle it with a little oil. Cover the bowl with plastic wrap and set aside to rise until doubled in size, about an hour. 5. Preheat your oven to 325 degrees. Spray a 9 x 15 loaf pan with a little baking spray, if you want the extra insurance that it will come out. 6. Flour your work surface and knead the dough a bit, then roll it out into a rectangle about 9 x 15 inches. 7. Mix the brown sugar and cinnamon and spread it evenly over the rectangle, leaving about 3 inches un-sugared at the far end. 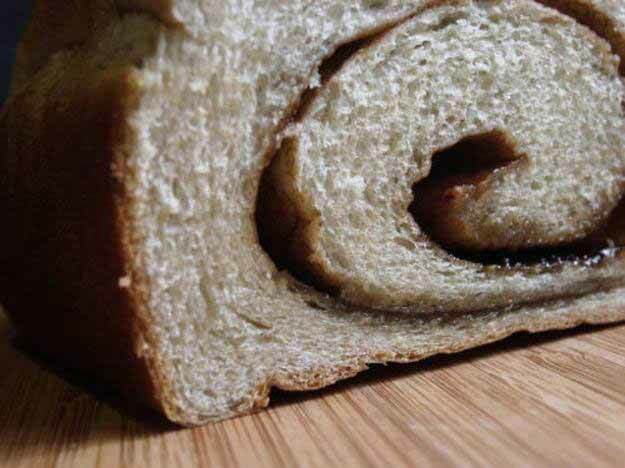 Roll the dough up, jellyroll-style, so you've got a 9-inch long log. Pinch to seal the ends and the seam. 8. Place the dough seam-side down in the pan. Cover the pan with plastic wrap and let rise until doubled, about 30 minutes. 9. Bake at 325 degrees for 35-40 minutes, until dark golden brown. 10. Remove the loaf from the pan and let it cool completely on a rack before cutting.